Pacific Rim (2013) | Who Killed Orrin Grey? I tried really hard not to get too excited about Pacific Rim. 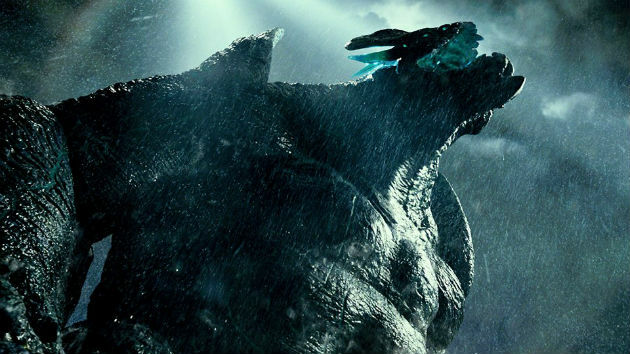 I’ve been let down by Guillermo del Toro’s big budget movies before (Hellboy 2, I am looking meaningfully in your direction) and while I love all monsters and grew up on Godzilla movies, the whole kaiju subgenre is no longer really in my creative wheelhouse the way it once was. But it didn’t take more than about one trailer for Pacific Rim to overcome my defenses and vault it to the number one spot of movies I was looking forward to this year. I know that not everyone felt the same way about the trailers, though. When I first got back from the preview screening on Tuesday night, I posted to Twitter that “If you think you’ll like Pacific Rim, you are probably not wrong.” I’ll stand by that. If you don’t think you’ll like Pacific Rim, well, I don’t know what to tell you about it. We probably have very different taste in movies anyway, so you might not want to listen to me. Pacific Rim was everything that I needed it to be. There were lots of monsters, and they looked great. I went home wanting toys of them. The fight scenes were suitably epic, building-crushing things, designed to convey at every turn the sheer size and scope and weight of what was happening. The movie around them wasn’t any dumber than it needed to be, and it didn’t try to be any smarter than it needed to be either. Probably the best thing you can say about Pacific Rim is that there’s no cynicism, no guilt apparent in its construction. It is a movie about giant robots punching giant monsters made by people who love that, and who think you should love it too. They’re not trying to cash in on a product they don’t care about, and they’re not ashamed of the big, cartoony aspects of what they’re doing. There’s something inherently silly about a robot punching a monster with a rocket fist, it’s true. But while Guillermo del Toro knows that it’s silly, he still treats it with respect, not as something shameful, or as an in-joke. The result is a $180 million dollar Saturday morning cartoon, made by a master craftsman. It aspires to no more than that, and it delivers that superbly. There’s a tendency, when talking about movies, to act as if there’s one standard that all movies should be held to. One sort of ur-movie, and that we want every movie to be it. But it’s not so, at least not for me. I love quiet, thoughtful, introspective movies. I also love city crushing blockbusters. The only thing I ask of them in common is that they both be done with skill, by people who do their work well, and who obviously care about what they’re doing. On that front, Pacific Rim certainly delivers. I’ve talked before about the movie that we’ll hopefully someday get that’s a perfect marriage of the heart of del Toro’s independent films with the visual potency of his big budget ones. This isn’t it, not quite, but it’s close. It’s technically stunning, as visually rich as any blockbuster I’ve ever seen, filled with effects shots, and overflowing with del Toro’s aesthetics. It’s also beautiful in places. There’s a moment in a bunker during the kaiju attack on Hong Kong that was so unexpectedly lovely that I wanted it to go on for at least a few frames longer than it did. Maybe forever. Del Toro obviously isn’t ashamed of this movie. He’s not cashing in, not collecting a paycheck. There’s every bit as much of his heart in this as there was in Pan’s Labyrinth, it’s just a different part of his heart, is all. Yeah, this is what I signed on for. I’ve seen the movie compared to just about everything at this point, with varying degrees of accuracy. Structurally, though, its closest relation might be something like Independence Day, without the jingoism, and with robots in place of fighter jets and giant monsters in place of giant spaceships. (Which is to say: better!) The climax owes a lot to that film, which has apparently given us the template for the climaxes of all invasion films from here on out. (See also: Avengers.) That’s fine, though. In some ways, the familiarity is a boon, taking some of the weight of the world building off the shoulders of the narrative and allowing it to spin out in little details in the background. Because we all know how this is going, they don’t have to spend as much time explaining it to us, and can instead just get into the monster punching, the monster organ dealing, and so on. Pacific Rim isn’t a perfect movie. There are a few problems, but very few of them actually mean much. The climax may not hold up to repeat viewings as well as the earlier fights. The supporting characters all stepped straight out of an anime or Saturday morning cartoon and are (unfortunately) never really fleshed out. See above re: there needing to be at least one more big fight sequence, and why. But most of what’s wrong with Pacific Rim are things just like that; places where it could have done more, rather than places where it did something wrong. It may not be the perfect giant robots versus giant monsters movie, but it’s the best one we’ve ever gotten, and it’s probably a better one than we deserve (especially if the early and disheartening tracking numbers for the movie’s box office performance prove true). We need movies like Pacific Rim. Movies that treat entertainment and spectacle as important, and worthy of the same care and craft that you’d bring to a “serious” film. If you think you’ll like Pacific Rim, then you’e probably already going to the theatre this weekend anyway. And if you don’t think you’ll like Pacific Rim, think about whether you like the idea of $180 million dollar movies made by visionary directors who love and care about what they’re doing, and consider maybe giving it a shot anyway.